According to Milton Berle, “laughter is an instant vacation” and who couldn’t use a vacation? Especially when it’s free! The picture books listed below are guaranteed to tickle your funny bone. 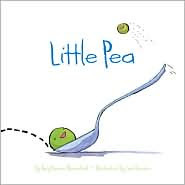 This is the story of a little pea who has to eat candy for dinner every night or else he will not get his dessert. There’s only one problem, Little Pea hates candy! However, he manages to get down five pieces (the required amount according to Mama Pea and Papa Pea) with a sound of hilarious disgust after each piece. His reward for complying is a big bowl of spinach for dessert, his favorite! Also check out Little Hoot and Spoon written by the same author and equally as amusing. This is the story of a chicken named Minerva Louise who is intrigued by “the house with the red curtains.” Once inside, this naïve hen mistakes both the fireplace and a flowerpot as good places for a nest and the house cat for a “friendly cow.” After a few more mix-ups she eventually goes back outside with a promise to return which she does, finding a cozy spot on top of a freshly baked pie. This is the first in a series of adventures for Minerva Louise. This practically wordless picture book is full of hilarious moments when on a Tuesday evening around eight o’clock a group of frogs on flying lily pads invade a suburban neighborhood terrorizing dogs and leaving police baffled when lily pads are found littering the streets the next morning. The book ends with a glimpse of what happens the following Tuesday…flying pigs! 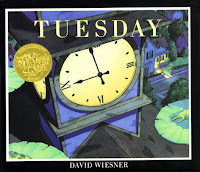 This book also won the Caldecott Award for its illustrations.